Napoleon Bonaparte is credited with the saying, “Soldiers generally win battles; generals get credit for them.” This would generally seem to be the case, as while many may have heard of General Walter Krueger, commander of U.S. Sixth Army in the Pacific, very few have ever heard of Walter E. Pottle, the first sergeant for Company M, 103rd Infantry Regiment. Well, I aim to change that. Walt Pottle – from what few accounts there are – was a soldier’s soldier. Born in 1912 in the small town of Randolph, Maine, Walt fit right into the Army National Guard. When the war started, the affable Mainer was a clerk in the grocery store in Randolph, with a wife and two kids. Off he went with his regiment in 1941, however, when they were all called up for the Louisiana Maneuvers. Due to the Pearl Harbor attacks, the regiment’s activation was extended indefinitely, and Walt Pottle and Company M were headed to war. 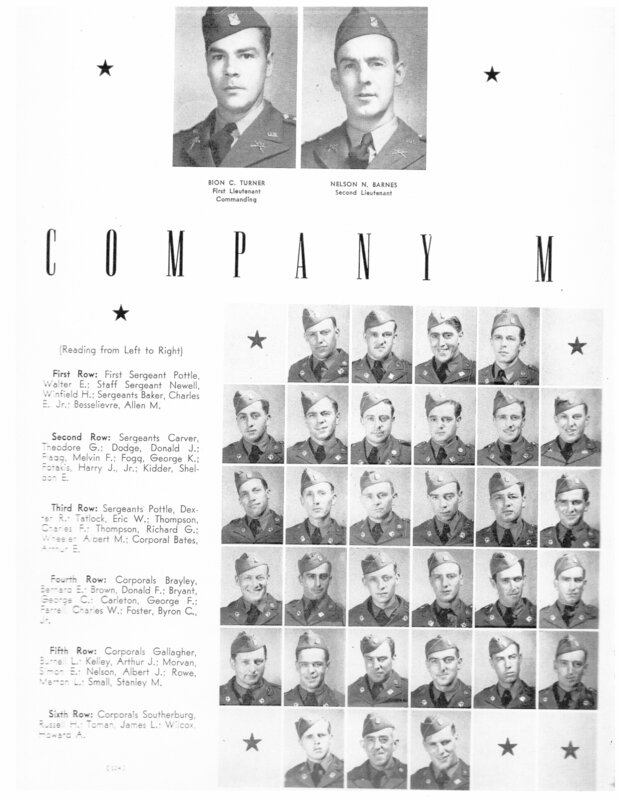 Roster of Company M at Camp Shelby, Mississippi, prior to the war. First Sergeant Pottle can be seen first on the left of the top row. From the start, the soldiers loved their first sergeant. A National Guard outfit, most of the men were from the Augusta, Maine area. Even as replacements came in from all across the U.S. as the war dragged on, Walt was a symbol of the company’s Maine roots. He was the type of person who soldiers felt that they could instinctively confide in. He took care of his men at their most homesick, helping them write letters, or bringing their mail out to them on the front lines. When one of his men got in trouble, Walt would outmaneuver the angry officer into a more lenient punishment, confessing, “A good first sergeant oughta be sent to the guard house for half of his life to make up for all the things he has to do to be a good first sergeant.” He was a constant visitor to those of his men who were wounded, always bringing them any extra food or delicacies he had “scrounged.” His men trusted and loved him, and Walt appeared to regard them the same way. Walt also loved a good time. He was the type of man to make his own fun if he couldn’t find any. During their time stateside before they left for the Pacific, Walt and some other NCOs and officers were engaged in some light to moderate drinking. Walt was attempting to dance on top of his Buick, when he was accosted by the military police and told to stop, at which he roared, “By God, this is my car, and I got a special priority to kick out the headlights if I wanta, and I think I wanta.” Later on, when the regiment was overseas, Walt lured away some chickens the officers were saving for their dinner and had a fried chicken dinner with his NCOs. The next morning, First Sergeant Pottle assured the upset officers that he would bring the culprit to justice. He was the type of man who myths and legends were attributed to, and because of the nature of the man, it seemed always hard to differentiate what was myth and what was truth. But what endeared him to officers and men alike, was his fighting spirit. As first sergeant, he could have remained back in the command post. But that just wasn’t Walt Pottle. During the thick of the fighting on Luzon in January of 1945, when his company commander and many other men had just been killed by Japanese artillery fire, Walt mustered a bunch of clerks and cooks together to form a rescue mission. With litters made out of coats and tent poles, Walt and his little outfit rushed out under fire to rescue twelve wounded men and bring them back to the lines. 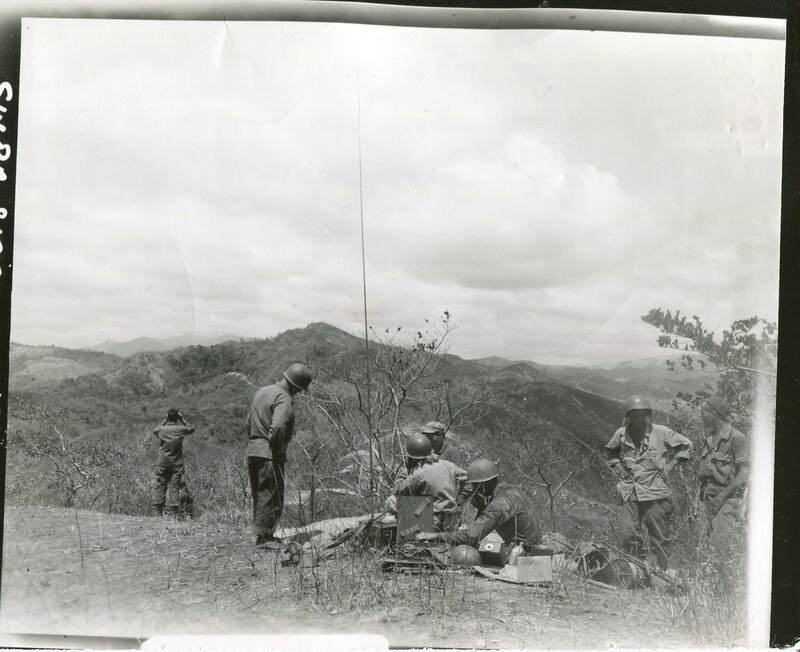 Similarly, a few months later, as Company M was assaulting the daunting 1,200 foot Mount Tanuan, a report came back to the first sergeant that one of the company’s patrols was cut off on the top of the mountain. Without hesitation and despite warnings about enemy strength, Walt led a patrol to the top of the hill and resupplied his “lost” men with ammo and food. It was this eagerness for battle that proved his undoing. 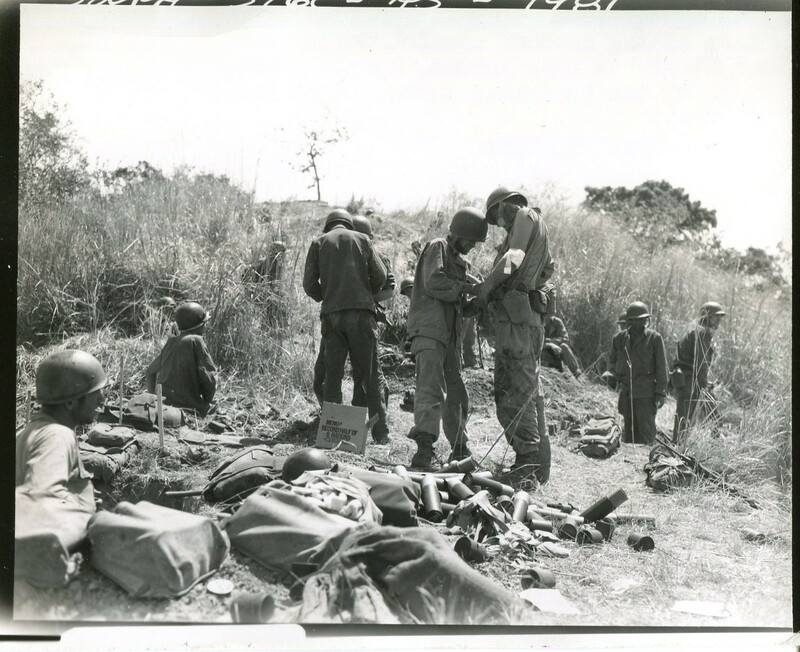 The fighting on Luzon was practically over, only mopping up operations remained. Leading from the front, Walt was working with some of the teams that were clearing out cave positions. 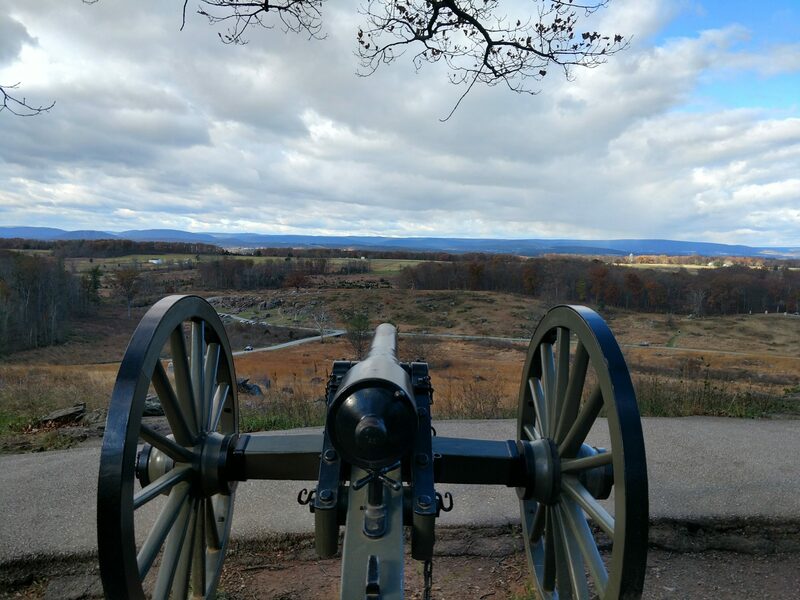 The troops were familiar with this type of fighting, and once they had identified that there were enemy fortified inside a cave, they would either throw in a satchel charge or call in artillery to blow the cave up. This particular day, Walt entered the cave first, well ahead of his men. Shots rang out, followed by a sound of scuffling, and the men rushed into the cave, just as Walt was emerging. They saw on his face that something was wrong, and he motioned them back, yelling, “Look out, fellas!” As they retreated, a thundering roar shook the cave and the force of the explosion threw them all backwards. However, their lives were saved by the warning from their first sergeant, who had not been so fortunate. The explosion caught him directly in its path and he was killed in the blast. Morale in the company, and even the regiment, sagged as the news of Walt Pottle’s death spread. His loss was felt keenly. Although one report states that his body was recovered and sent home to Randolph, there is no burial information listed for him and the town reports his body as being “Lost or Destroyed.” As with all soldiers killed in action, he was awarded the Purple Heart Medal. Surely his actions merit more official recognition, but in lieu of that, keeping him in our memory is the least we can do to honor his sacrifice.